"Philip the Handsome" redirects here. For the other Philip known as Philip the Handsome or Philip the Fair, see Philip IV of France. Philip of Habsburg[a] (22 July 1478 – 25 September 1506), called the Handsome or the Fair, was Duke of Burgundy from 1482 to 1506 and the first member of the house of Habsburg to be King of Castile as Philip I. The son of Holy Roman Emperor Maximilian I by his first wife Mary, Philip was less than four years old when his mother died, and upon her death, he inherited the greater part of the Duchy of Burgundy and the Burgundian Netherlands as Philip IV. In 1496, his father arranged for him to marry Joanna of Castile, second daughter of Ferdinand and Isabella, rulers of Aragon and Castile respectively. Around the same time, Philip's sister Margaret was given in marriage to Joanna's brother John, as part of an agreement between their fathers. Within four years after the wedding, Joanna became heir presumptive to Aragon and Castile, following the deaths of her brother, elder sister and infant nephew during that period. In 1504, aged 27, Philip became king of Castile jure uxoris when his mother-in-law died and Joanna succeeded her. He died only two years later, leaving his wife distraught with grief. Philip was the first Habsburg monarch in Spain, and is the progenitor of every later monarch of Spain, even up to today. He died before his father, and therefore never inherited his father's territories or became Holy Roman Emperor. However, his son Emperor Charles V eventually united the Habsburg, Burgundian, Castilian, and Aragonese inheritances. Philip holds a special place in Habsburg history because he was the pivot around which the dynasty acquired a large portion of its extensive lands. By inheriting Burgundy from his mother (which included present-day Netherlands, Belgium and parts of France) and by acquiring much of Spain and its possessions in the New World by marriage to Joanna, Philip was instrumental in vastly enhancing the territories of the Habsburgs, and his progeny would dominate European history for the next two centuries. Philip's wife Joanna was an elder sister to Catherine of Aragon, who married successively the brothers Arthur, Prince of Wales and King Henry VIII of England. He did once visit England, and the young Prince Henry was much impressed with him. Indeed, Henry is said to have regarded Philip as providing a model of leadership towards which he aspired. Philip was born in Bruges, the son of the future Maximilian I, Holy Roman Emperor, by his first wife Mary, Duchess of Burgundy. He was born in the County of Flanders (today in Belgium) during the reign of his grandfather Frederick III. The child was named in honour of his great-grandfather, Philip the Good, grandfather of his mother Mary. 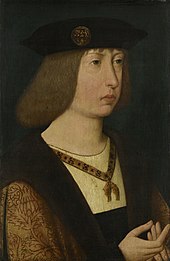 Philip was only four years old when his mother died in 1482, resulting in him succeeded her as ruler of the Burgundian possessions under the guardianship of his father. A period of turmoil ensued which witnessed sporadic hostilities between, principally, the large towns of Flanders (especially Ghent and Bruges) and the supporters of Maximilian. During this interregnum, Philip became caught up in events and was even briefly sequestered in Bruges as part of the larger Flemish campaign to support their claims of greater autonomy, which they had wrested from Mary of Burgundy in an agreement known as the Great Privilege of 1477. By the early 1490s, the turmoil of the interregnum gave way to an uneasy stand-off, with neither French support for the cities of the Franc (Flanders), nor Imperial support from Philip's grandfather, Emperor Frederick III proving decisive. Both sides came to terms in the Treaty of Senlis in 1493, when Emperor Frederick died and Philip's father Maximilian became the new emperor. This smoothed over the internal power struggle as the two sides agreed to make the 15-year-old Philip crown prince in the following year. In 1494, Maximilian relinquished his regency under the terms of the Treaty of Senlis and Philip, aged 16, took over the rule of the Burgundian lands himself, although in practice authority was derived from a council of Burgundian notables. On 20 October 1496, he married Joanna, daughter of King Ferdinand II of Aragon and Queen Isabella I of Castile, in Lier, Belgium. The marriage was one of a set of family alliances between the Habsburgs and the Trastámara, designed to strengthen against growing French power, which had increased significantly thanks to the policies of Louis XI and the successful assertion of regal power after war with the League of the Public Weal. The matter became more urgent after Charles VIII's invasion of Italy (known as the First Peninsular War). Philip's sister Margaret married John, Prince of Asturias, only son of Ferdinand and Isabella and heir apparent to the unified crowns of Castile and Aragon. The double alliance was never intended to let the Spanish kingdoms fall under Habsburg control. At the time of her marriage to Philip, Joanna was third in line to the throne, with John and their sister Isabella married and hopeful of progeny. In 1500, shortly after the birth of Joanna and Philip's second child (the future Emperor Charles V), in Flanders, the succession to the Castilian and Aragonese crowns was thrown into turmoil. The heir apparent, John, had died in 1497 very shortly after his marriage to Margaret of Austria. The crown thereby seemed destined to devolve upon his and Joanna's elder sister Isabella, wife of Manuel I of Portugal. She died in 1498, while giving birth to a son named Miguel da Paz, to whom succession to the united crowns of Castile, Aragon and Portugal now fell; however, the infant was sickly and died during the summer of 1500. The succession to the Castilian and Aragonese crowns now fell to Joanna. Because Ferdinand could produce another heir, the Cortes of Aragon refused to recognize Joanna as heir presumptive to the Kingdom of Aragon. In the Kingdom of Castile, however, the succession was clear. Moreover, there was no Salic tradition which the Castilian Cortes could use to thwart the succession passing to Joanna. At this point, the issue of Joanna's supposed mental incompetence moved from courtly annoyance to the center of the political stage, since it was clear that Philip and his Burgundian entourage would be the real power-holders in Castile. In 1502, Philip, Joanna and a large part of the Burgundian court travelled to Spain to receive fealty from the Cortes of Castile as heirs, a journey chronicled in intense detail by Antoon I van Lalaing (French: Antoine de Lalaing), the future Stadtholder of Holland and Zeeland. Philip and the majority of the court returned to the Low Countries in the following year, leaving a pregnant Joanna behind in Madrid, where she gave birth to Ferdinand, later Holy Roman Emperor. Although Joanna was deeply in love with Philip, their married life was rendered extremely unhappy by his infidelity and political insecurity, during which time he constantly attempted to usurp her legal birthrights of power. This led in great part to the rumors of her insanity due to reports of depressive or neurotic acts committed while she was being imprisoned or coerced by her husband, rumors that benefited Philip politically. Most historians now agree she was merely clinically depressed at the time, not insane as commonly believed. Before her mother's death, in 1504, husband and wife were already living apart. In 1504, Philip's mother-in-law, Queen Isabella of Castile, died, leaving the Crown of Castile to Joanna. Isabella I's widower and former co-monarch, King Ferdinand II, endeavored to lay hands on the regency of Castile, but the nobles, who disliked and feared him, forced him to withdraw. Philip was summoned to Spain, where he was recognized as king. However, en route to Spain in January 1506, Philip and Joanna were caught in a tempest and shipwrecked off the Dorset coast, forcing them on shore near Melcombe Regis. The couple stayed as guests of Henry VII of England but were in fact hostages for the duration of their stay. To get released Philip was forced to sign a treaty with Henry VII–the so-called Malus Intercursus–which included a mutual defense pact, the extradition of rebels, including the Earl of Suffolk, Edmund de la Pole, who as an exile was a guest of Philip in the Low Countries, and a trade agreement which allowed English merchants to import cloth duty-free into the Low Countries. After handing over Edmund, Philip and Joanna were allowed to leave England after a stay of six weeks. Philip and Joanna landed at Corunna on 28 April 1506, accompanied by a body of German mercenaries. Father- and son-in-law mediated under Cardinal Cisneros at Remesal, near Puebla de Sanabria, and at Renedo, the only result of which was an indecent family quarrel, in which Ferdinand professed to defend the interests of his daughter, who he said was imprisoned by her husband. In meetings between 20th and 27th June, mediated by Cardinal Cisneros, the senior churchman in Spain, Ferdinand accepted that his 'most beloved children (Joanna and Philip) should take over control of Castile. The two kings then agreed that Juana was neither fit nor inclined to rule 'considering her infirmities and sufferings, which for the sake of honour are not expressed' and further that if 'the said most serene Queen, either from her own choice or from being persuaded by other persons should attempt to meddle in the government both would prevent it'. It suited both her father and her husband that she be regarded as incapable. On 27 June 1506, the Treaty of Villafáfila was signed between Ferdinand and Philip, with Philip being proclaimed King of Castile by the Cortes of Valladolid. Yet on the same day Ferdinand drew up secret documents renouncing all the agreements on the grounds of coercion, claiming that he would never otherwise have signed treaties that did 'such enormous damage to the said most serene Queen, my daughter, and me'. Having left his options for the future open, he departed for Aragon. However, Philip died suddenly at Burgos, apparently of typhoid fever, on 25 September 1506, although a poisoning (assassination) was widely spoken of at the time, and is what his wife believed to be the cause of Philip's death. His wife supposedly refused to allow his body to be buried or part from it for a while. Philip I is entombed at the Royal Chapel of Granada (Capilla Real de Granada), alongside his wife, and her parents Isabella I and Ferdinand II. ^ Constantin von Wurzbach (1861). "Habsburg, Philipp I. der Schöne von Oesterreich". Biographisches Lexikon des Kaiserthums Oesterreich. 7. L. C. Zamarski. p. 112. ^ Sicking 2004, p. 315. ^ Penn, Thomas (2011). Winter King: The Dawn of Tudor England. London: Allen Lane. pp. 213–226. ISBN 9781439191569. ^ Elliott, John. Imperial Spain. ^ Heath, Richard (2018). Charles V: Duty and Dynasty. The Emperor and his Changing World 1500-1558. p. 17. ISBN 9781725852785. ^ Campbell 2016, p. 184. ^ Winder, Simon (2014). Danubia: A Personal History of Habsburg Europe. Farrar, Straus and Giroux. p. 68. ^ a b c d Poupardin, René (1911). "Charles, called The Bold duke of Burgundy" . In Chisholm, Hugh (ed.). Encyclopædia Britannica. 5 (11th ed.). Cambridge University Press. Wikimedia Commons has media related to Philip I of Castile. Campbell, Anna (2016). "Colette of Corbie: Cult and Canonization". In Mueller, Joan; Warren, Nancy Bradley (eds.). A Companion to Colette of Corbie. Vol. 66. Brill. Sicking, L H J (2004). Neptune and the Netherlands: State, Economy, and War at Sea in the Renaissance. Brill.